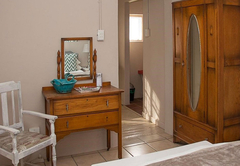 @ Mango's is a property providing self catering in Beaufort West for up to 4 guests visiting the Karoo region. 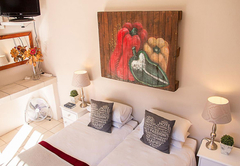 Situated in Beaufort West, @ Mango's is a self catering cottage on the same property as the main house. 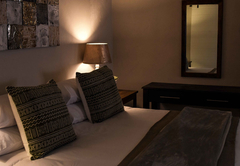 From here you are close to attractions including the Chris Barnard Museum and the Karoo National Park. 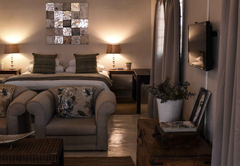 @ Mango's Cottage sleeps four guests in one bedroom with a double bed and two single beds in the lounge. The bedroom has an en-suite bathroom with a shower. The kitchen is fully equipped and contains an oven, microwave, small fridge, tea / coffee making facilities, crockery and cutlery. 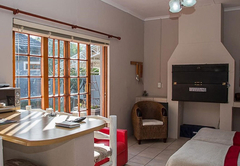 The living area has a built in braai, air conditioning and a TV with DStv channels for your viewing pleasure. 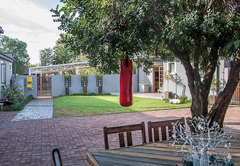 The patio area is equipped with braai facilities. The property offers safe undercover parking behind electric gates. Response time@ Mango's typically responds to requests in 5-10 minutes.